The new defence system against the evil koalas has recently boiled down to "everyone just running around and getting them whichever way they can." It seems to work. Remaining koalas are huddling together trying to think of plans of a counter attack, but keep failing. Some say that the hired strangler assassin is highly unnecessary. <Lauren> Yeah, but if you don't keep those pesky critters under control, they eat all the foliage. <Lauren> Ah, but 3Suns, the hat is part of his disguise, as are the phony mustache and fake hair sprouting from his ears. The best assassins always don an unassuming disguise, the better to help them blend in with the crowd. <Carol> Hee hee. Convenient how he carries his strangling equipment with him. 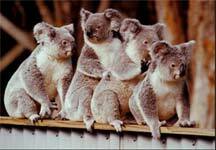 <mypalmike> These wouldn't happen to be the koalas of DOOM, would they? <Stormi> Why not? Koalas of DOOM certainly has an appeal to it.